Few cigar brands are as diverse as the current portfolio from CAO. Flathead and Steel Horse are built to attract blue-collar tough guys who fancy muscle cars, pinup girls, and motorcycles. Margaritaville would be most at home with the baby boomer dads and grandpas who occasionally smoke as they grill dinner on the back deck while wearing a Hawaiian shirt. Then there’s Flavours, the country-specific blends (Brazilia, Italia, Colombia, etc. ), and holiday limited editions like Angry Santa and Evil Snowman. One of the 2015 releases from CAO caught my eye. Called CAO Pilón, the line seems intended for more serious cigar smokers who care about tobacco and probably spend a good portion of their cigar budgets on boutique-made smokes. CAO classifies Pilón in the Classic quadrant of its lineup, which also includes Gold and La Traviata. Crafted by Master Blender Rick Rodriguez, whose name and recipe adorns the attractive CAO Pilón band, the blend consists of an Ecuadoran Habano wrapper around Nicaraguan binder and filler tobaccos. Three sizes are available in the affordable $6 to $7.25 range: Corona (5.5 x 44), Churchill (7 x 48), and Robusto (5 x 52). The latter makes a good first impression with a clean, seamless exterior that’s both smooth and dry. Firm to the touch, the Robusto’s foot shows a well-packed cross-section of tobaccos that exude pre-light notes of cocoa powder and musty earth. The head clips easily to reveal a stiff cold draw with a slight sweetness on the lips. I appreciate that the two ends of the band are joined by an external band sticker—which both makes the band easy to remove and prevents any errant adhesive from making its way to the wrapper. At the outset, the medium-bodied profile carries notes of dry wood, leather, coffee, and sweet cream. The overall effect might be best summed by the phrase “warm tobacco.” The aftertaste leaves considerable cedary spice on the tongue, while the retrohale enables you to pick up a little dried fruit and nuts. As the cigar progresses, I find the flavors remain fairly consistent, save for an increase in intensity in the final third that brings a dose of black pepper. From light to nub, the burn line remains straight and the gray ash holds well off the foot. However, I find the tight draw and low level of smoke production to be frustrating. These physical attributes were similar across the three samples I smoked for this review. 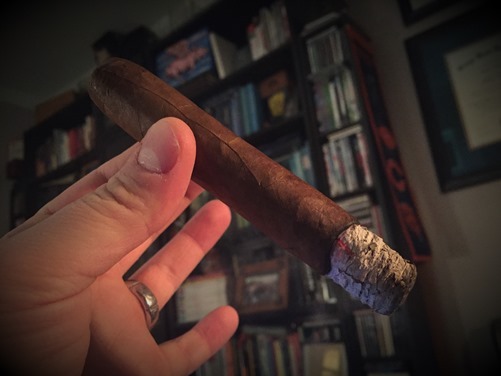 Draw and smoke production aside, this is an enjoyable—albeit straightforward—cigar with a mellow profile that renders it approachable and somewhat classic-tasting, especially for the friendly price. Some will find it just their speed, others will say it lacks pop and complexity. In my book, the CAO Pilón Robusto is worthy of three stogies out of five.